Whistlestop by Quick Delivery ~ Philippine Freebies, Promos, Contests and MORE! 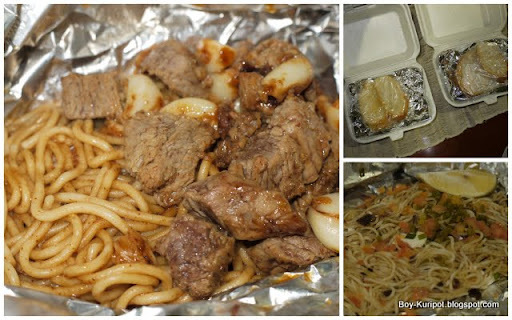 A few weeks ago, Mel and I got some take out food courtesy of Quick Delivery. Out of their 90 partner restaurants, I made an order at Whistlestop. It's been a really long time since I last ate there so I had no idea what to order. We ordered just in time for dinnertime! 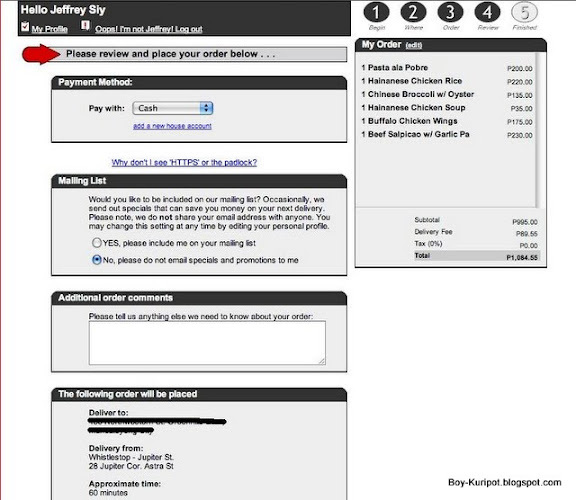 As Mel logged into Quick Delivery's website to check out the menu of Whistlestop, we stumbled upon their online ordering system. 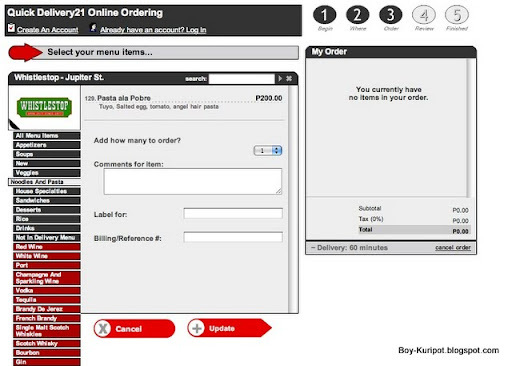 The last tab, the "Order Now" tab showed us all the restaurants Quick Delivery caters to. We first ordered the Pasta ala Pobre by simply clicking on its name on the list. Every time you click on a food item, the window above will show up. From there, it's easy to indicate the quantity of that food item you want, add-ons you want included, and other notes you want. The only thing that confuses me is the text box for the Label and Billing Reference Number. I'm not sure what to do with it so I left it blank. My guess is that the label is for labeling names on the food especially if you ordered a lot of items for different persons. As for the Billing Reference Number, I really have no idea. Once the Check Out button was clicked, I was asked to register on the site to get my delivery address and phone number. This then brought me to the page above containing my deliver address, total bill, and payment method. There's even an additional comment box available. 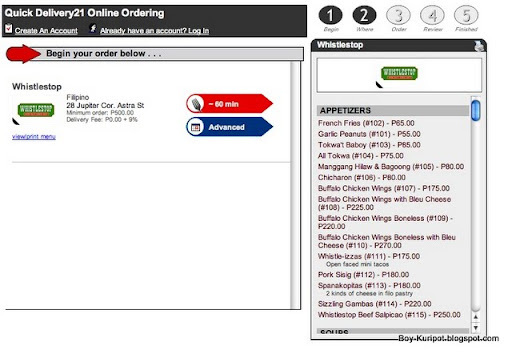 My total bill was P1,022.40 inclusive of the delivery fee. We had to pay an extra P85 because the place we had our food delivered to was outside the delivery area. At least you could still order the food that you want anywhere you want. After a few minutes upon placing my order, my phone rang. The number indicated on my profile was my landline number at house but they seemed to know my cellphone number so they called me on my mobile instead. They should have implemented a way wherein every time you put in a new location, you are asked to input the landline of that location as well. The Quick Delivery call center agent simply reconfirmed my orders. I canceled the Chinese Broccoli at the last minute. 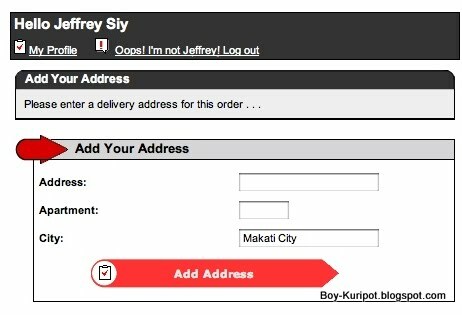 They told me that my order would arrive in 60 mins to 90 mins since my order came from Makati. Around 90mins later, the doorbell rang and there was our order. Funny thing happened when I was opening the styropor containers. The two container which were on top of each other melted and glued itself together. The Pasta ala Pobre was probably my least favorite of the lot. I'm not sure how it's supposed to taste like but it tasted a bit odd to me. The flavor didn't seem to marinated well into the pasta. Definitely worth it was the Beef Salpicao with the big serving. It was simply delightful. The tenderness of the beef was just right. We had to order the Hainanese Chicken Soup separately from the Hainanese Chicken rice. I found it a weird that it's offered separately. Well I guess some restaurants offer the Hainanese Chicken as a dish but for me, it's simply incomplete without the soup! This is how you should eat a Hainanese Chicken. 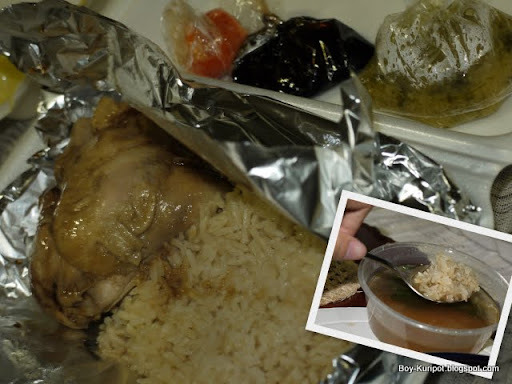 Get a spoonful of rice, submerge it partially in in soup and eat it with the chicken. This is simply the food for the soul. 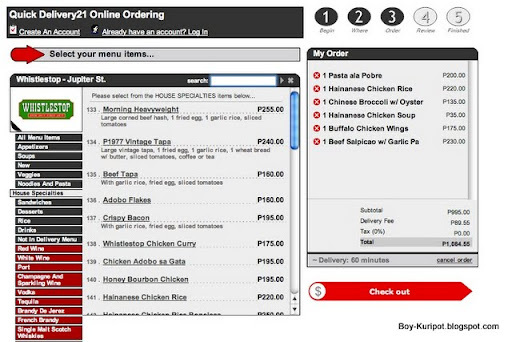 This is good for both individual and group orders.